Martha Burr and Mei-Juin Chen are currently producing a documentary titled The Black Kung Fu Experience, co-produced by ITVS and Lotus Films International, which will soon be broadcast on the famous national American channel PBS (Public Broadcasting Service). At the end of September, the two producers will begin the last part of filming in Cameroon, in the company of Master Saatenang who will lead them along the footsteps of his extraordinary destiny. In fact, the documentary, made in the form of chronicles, especially focuses on this Black Shaolin; no doubt he’s one of the few on earth to embody not without a certain elegance an exceptional and unprecedented cultural mosaic. Prince of Bafou. 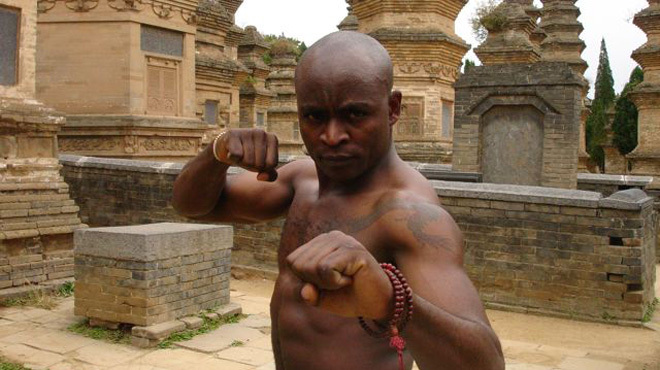 First African member of Shaolin Temple. Shi Yan Mai in a way personifies a common thread that the two journalists are undertaking to follow. Neither East. Nor West. Africa’s colors. China’s ink. On his shoulder and in his heart. This film will also be the opportunity to discover or rediscover the strong cultural currents emerging from this resolutely multi-ethnic Black Kung Fu Experience: blaxploitation, reggae made in Jamaica, or even Hip Hop and urban culture.